Welcome. I am so happy that you stopped by. My garden gate is always open for yor to come in and sit and relax with a cup of tea while I share with you the inspirations for my art. Let's join Bentley, My Studio Assistant, to look for inspirations in the garden to paint. Sunflowers are one of my favorite flowers to paint and are in most of my garden paintings. My 1958 Rocket vintage bicycle is so special - it is not in condition to ride anymore so I gave it a new home parked in my garden. I am often asked to sell it for parts and I can not bear to see it torn up - it is now resting comfortably and happily among the flowers in my garden and is frequently the inspiration for my garden paintings. I plant the basket with seasonal flowers - this Spring the basket is planted with red geraniums and a few Nasturtium. This year I am documenting my garden by painting some of my favorite things and wanted to paint my dear old vintage bicycle resting among the flowers. Thank you for stopping by. I love hearing from you and sincerely appreciate your visits, comments, e-mails, and those who follow my blog. Please let me know if you have any questions or would like to see me paint something special. I will be taking a little blog break and will be back on June 18th. The Geraniums are in full bloom and I wanted to share them with you before I take a blog break. I love your painting!!! How blessed you are to have such talent! Beautiful artwork! Would love to own it! Love that old bike. I agree with you, it is a keeper. Bentley always looks cool in the photos. Love your bicycle painting Erin, really enchanting. Oh how I've missed reading your blog! Life has been quite busy here, but today is a rainy, cool day so I am sitting here watching movies and blog reading. As always your paintings are fantastic! Hi! This is my first visit to your beautiful garden blog! And I'm just loving it so much! So, I started following it. I recently started a new blog about some of my favorite things...gardening and tea are just couple. Stop on over sometime..
Erin- this is the bicycle version of Pinky and Blue Boy--- I love this vintage bike-- love the pink one too. 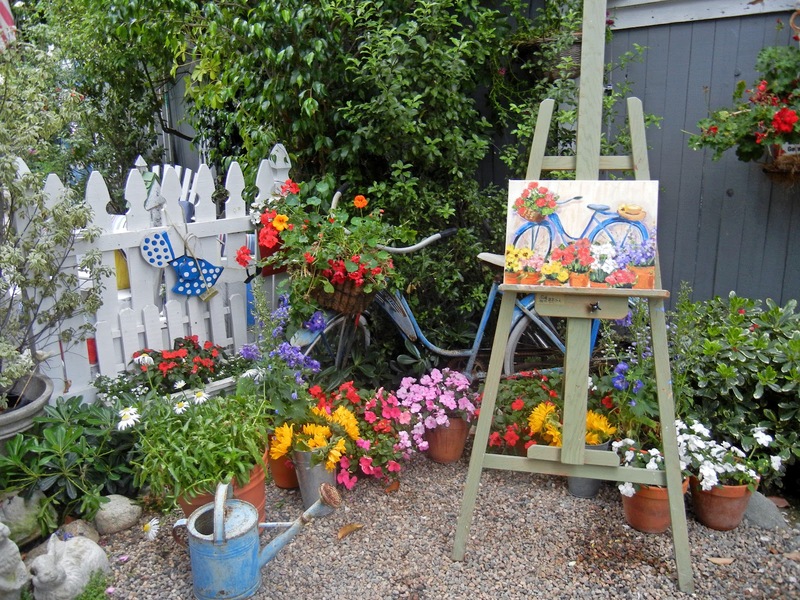 The painting is just amazing-- as is your fabulous cottage garden!! No wonder you love it so much- it's such a beautiful source of inspiration for you and Bentley! I love your garden and your creative ideas! I'm in the process of choosing how to do my very small garden area off the back patio of our very small condo. You've given me some ideas. Thank you! I love your page so much. It is pretty.